Elon Musk is admitting he messed up — sort of. 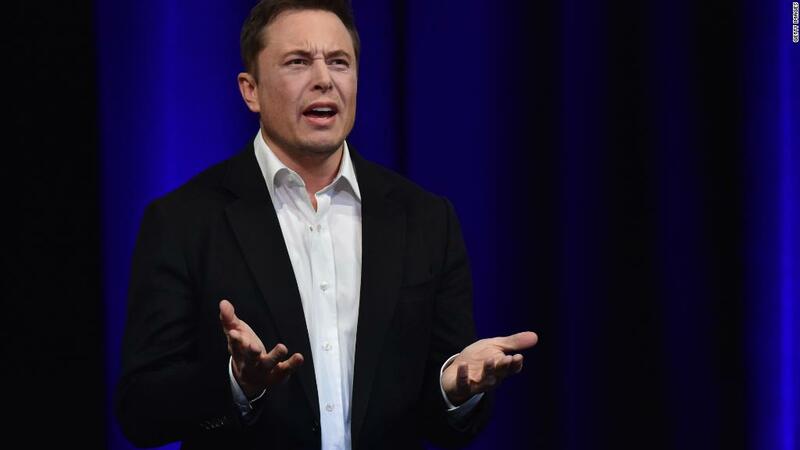 Days after the Tesla (TSLA) boss shocked Wall Street by completely dismissing critical questions from two analysts as "boring," Musk said on Friday it was "foolish of me" to ignore the queries. Musk's insults, and his refusal even to respond to legitimate questions, made for one of the weirdest corporate earnings conference calls in recent memory. The bizarre performance sent Tesla stock plunging, wiping $2.8 billion off its market value — and $632 million off Musk's personal stake. "I should have answered their questions, live," Musk tweeted a day later. Yet the Tesla CEO also mounted a defense of the call that may raise even more questions about his handling of the situation, which continues to overshadow the company's actual results. Musk suggested that the reason he dismissed the questions was because the analysts didn't have "buy" ratings on Tesla stock. But that's no reason to hand the call over to a blogger from YouTube for a dozen questions that spanned 23 minutes, which is what Musk did. "The 2 questioners I ignored on the Q1 call are sell-side analysts who represent short seller thesis, not investors," Musk tweeted. He's correct to call the analysts "sell-side," meaning they come from brokerage firms, which earn fees when clients trade stocks. And Musk accurately noted that Tesla is a favorite of short sellers, who bet against stocks. Tesla is the most heavily shorted stock in the Nasdaq 100, according to FactSet. One problem: While a sizable chunk of Wall Street analysts do have "sell" ratings on Tesla, the ones Musk ignored do not. Both Toni Sacconaghi of Bernstein and RBC's Joseph Spak have the equivalent of "neutral" ratings on Tesla. Even if they did advise clients to steer clear of Tesla's turbulent stock, that wouldn't be a good reason to dismiss their questions outright. Tesla stock has fallen 26% since its peak in September. Clearly, short sellers aren't the only people with questions about the company's precarious finances. Another problem: Wall Street analysts from sell-side brokerage firms are notorious for being reluctant to slap "sell" ratings on stocks. Brokerage firms fear that those negative ratings will anger companies and cost their clients special access to executives. Musk himself acknowledged during Wednesday's call that Tesla stock isn't for the faint of heart. "I'm not here to convince you to buy our stock," Musk said. "Do not buy it if volatility is scary." And the Tesla CEO did answer a question from one of Wall Street's biggest Tesla bears: Goldman Sachs analyst David Tamberrino. Actually, Musk responded to three separate questions from Tamberrino about the Model 3 and Model Y.
Musk's decision to pick a fight with Wall Street looks ill-timed. Tesla has relied on the capital markets to finance its grand ambitions, and many believe the company has burned so much cash that it will soon need to turn to Wall Street for more. Analysts expect Tesla may soon need to raise $2 billion by selling additional stock or debt. That task may be complicated by the past few days. Perhaps by the time Tesla needs more money, Musk's antics will be forgotten, or at least accepted as Elon being Elon. "We would consider Mr. Musk's at times unfiltered approach as part of the price to be paid for Elon's visionary genius," Efraim Levy, a CFRA Researach analyst, wrote to clients on Thursday. Levy added that although Tesla management should be "more disciplined publicly," the key to the stock is whether Tesla can ramp up production of the Model 3, its mass-market electric car. In the meantime, Musk isn't walking away from the harsh language he used Wednesday on the call. While Musk acknowledged he erred by ignoring questions, he also reinforced his criticism of the analysts. He explained that the question from Bernstein's Sacconaghi was "boneheaded" because the topic had already been covered in a shareholder letter. Musk further insulted RBC's Spak by saying he had asked an "absurd" question about demand for Tesla's Model 3 — easily the company's most important vehicle. Musk explained that the Model 3 already has about half a million reservations, "despite no advertising & no cars in showrooms." Musk rested his case with a parting shot and a warning to his critics. "Oh and uh short burn of the century coming soon," he tweeted, a prediction that the stock will rip higher. "Flamethrowers should arrive just in time."